With over 300 branches across North America, One of the central challenges faced by the bank was to access and update their policies and documents regularly, while ensuring that their employees across various locations are kept abreast of these changes. The client required a system to help them effectively manage, communicate, implement, and amend these policies and documents within the organization. 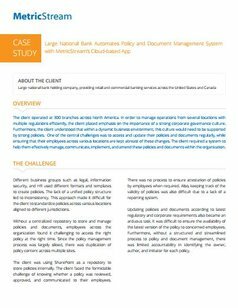 Read this case study to learn how the MetricStream Policy and Document Management app helped the client over come their challenges by standardising and streaming their policy management processes and automating many of the tasks that were previously manual.